A semi-trailer truck hit sagging power lines on Hicks Road north of Kirchoff Road and pulled down many lines and snapped four utility poles Wednesday night (See 40 photos on Facebook.com/CardinalEmergencies). 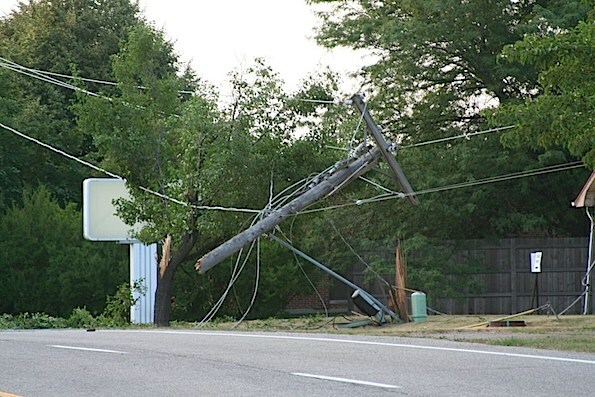 Rolling Meadows police and firefighters received a report about 6:53 p.m. Thursday of a power line down at Kirchoff Road and Hicks Road. Emergency responders were updated that a semi-trailer truck snagged power lines across Hicks Road, just north of Kirchoff Road. Firefighters also received a report of a fire behind the Marathon station and power lines down on cars — apparently parked cars. Numerous business in the area had a power surge. The first firefighters on the scene reported a brush fire and multiple power lines down. Four utility poles were snapped by the pull of the truck on the power lines. A large power outage occurred and several business has activated fire and/or security alarms. The intersection of Kirchoff Road and Hicks was closed for an extended period. Hicks Road and the frontage road south of Kirchoff were also blocked for an extended period.